Rule 1. Clerk’s Office Hours and Location. The Clerk’s office shall be open Monday through Friday from 8:30 a.m. to 4:30 p.m. EST/EDT. The office is closed on all Georgia State holidays and during severe inclement weather. The address is: Clerk, Court of Appeals of Georgia, Suite 501, 47 Trinity Avenue, S.W., Atlanta, Georgia 30334. The Court’s website is: www.gaappeals.us. The telephone number is (404) 656-3450. (a) Requirement for Written and Signed Documents. All filings, including, but not limited to, documents, motions, briefs, requests, applications, and communications relating to appeals shall be in writing and legible; shall be filed with the Clerk’s office; shall be signed, as further specified in subsections (1) and (2), by an attorney of record, an attorney granted courtesy appearance, or pro se party; shall include the mailing address, telephone number, and email address, if any, of the attorney or the pro se party signing the document; shall include the State Bar of Georgia membership number of all submitting attorneys; and shall show that copies have been served upon opposing counsel in accordance with Rule 6, Copies and Certificate of Service. Signatures must be handwritten by the submitting attorney or may be handwritten by another individual with express permission. Documents with conformed or stamped signatures shall not be accepted. (i) All electronic filings must be submitted in a searchable portable document format (.pdf) only. (ii) Signatures must be electronic or a conformed signature of the counsel filing the document, which means that counsel’s typed name is preceded by “/s/” and is underlined. Counsel’s typed name must also appear below the underline. If there are signatures of other attorneys on the document, use of the filing attorney’s login and password and the conformed signatures of the others will be presumed to mean that the filing attorney has the agreement of the other signatories to what is filed. (iii) Attorney filings must be in accordance with Rule 46, Electronic Filing of Documents. (b) Communications with the Court. There shall be no communications relating to pending cases to any judge or member of the judge’s staff. All documents filed with the Court shall be on letter size (8 ½" x 11") white paper or in a searchable portable document format (.pdf). All documents filed on paper (i.e., filings not electronically filed) shall be typed or printed on non-transparent white paper. All documents filed with the Court shall have no less than double spacing between the lines, excluding block quotations, headings, captions, and footnotes. Computer-generated documents must use a serif, proportionally spaced typeface of 14-point or larger. (Examples of compliant typefaces include Times New Roman and Century Schoolbook.) Sans-serif fonts may be used in headings and captions. A monospaced typeface (e.g., Courier) must not be used in computer-generated documents. Text must be set in plain, Roman style, although italics or boldface may be used for emphasis. Case names may be italicized or underlined. For documents prepared with a typewriter, the font size shall be no smaller than 10 characters per inch. Any documents that do not comply with the Court rules may be returned to counsel with notice of the defect of the pleading, and/or counsel may be ordered to redact and recast them. All reference to counsel in these rules shall include pro se parties. The Court does not accept facsimile filings. A party desiring to obtain a return copy of a paper document stamped as "filed" must provide an extra copy of the document and a pre-addressed stamped envelope with sufficient postage. When a filing deadline falls on a Saturday, Sunday, an official state or national holiday, or a time when the Clerk’s office is closed for an emergency (such as inclement weather), the deadline is extended to the next business day. This rule also applies to motions for reconsideration. See Rule 37, Motions for Reconsideration. (a) Physical Delivery Paper Filing. This section applies to pro se parties and counsel exempt from the electronic filing requirements. Except as otherwise provided in this rule, a paper filing will be deemed filed in the Court of Appeals on the date and time it is physically received in the office of the Clerk of the Court of Appeals with sufficient costs, if applicable, a proper certificate of service, stamped “filed,” and otherwise in conformity with these rules. (b) Drop Box Paper Filing. This section applies to pro se parties and to counsel exempt from the electronic filing requirements. When the office of the Clerk is not open, documents may be deposited in the Court of Appeals drop box for filing. Documents placed in the drop box are removed each morning and clock stamped with the present time and date, but shall be deemed filed on the prior business day if the documents comply with Court rules. The drop box is located inside the street level entrance to the 47 Trinity Avenue Building, which generally is open between 7:00 a.m. and 5:00 p.m., although the Georgia Building Authority may change the hours during which the building is open without prior notice. Note: This rule does not apply to motions for reconsideration, which must be received by the Court before 4:30 p.m. on the final due date. See Rule 37 (b), Motions for Reconsideration. (c) Filing by Mail or Commercial Delivery. This section applies to pro se parties and counsel exempt from the electronic filing requirements. A document transmitted to the office of the Clerk by United States Postal Service priority, express, or first-class mail (including certified or registered mail) or by a commercial carrier for overnight delivery shall be deemed filed on the date shown by the official postmark affixed by the United States Postal Service (not a private or commercial postage meter) or the date shown on the commercial carrier’s transmittal form on the envelope or package containing the document, if the envelope or package is properly addressed, postage prepaid, and the postmark or transmittal date is legible. Otherwise, the document will be deemed filed on the date the document was physically received in the office of the Clerk. Note: This rule does not apply to motions for reconsideration. See Rule 37 (b). (d) Filings by Pro Se Prisoners. In the absence of an official United States Postal Service postmark showing a date on or before the filing deadline, a document submitted by a prisoner who is not represented by an attorney shall be deemed filed on the date the prisoner delivers the document to prison officials for forwarding to the Clerk of the Court of Appeals. This delivery shall be shown by the date on the certificate of service or on an affidavit submitted by the prisoner with the document stating the date on which the prisoner gave the document to prison officials with sufficient prepaid postage for first-class mail and the name of the prison official to whom the document was delivered. The certificate or affidavit will give rise to a presumption that the date of filing reflected in the affidavit is accurate, but the State may rebut the presumption with evidence that the document was given to prison officials after the filing deadline or with insufficient postage. If the institution has a system designed for legal mail the prisoner must use it to rely upon the provisions of this paragraph. Note: This rule does not apply to motions for reconsideration. See Rule 37 (b). (e) Electronic Filing/Motions for Reconsideration. Efiled documents shall be deemed submitted on the date they are filed, up to 11:59 p.m., as long as they comply with this Court’s rules, with the exception of motions for reconsideration, which must be filed by 4:30 p.m. See Rule 37 (b), Motions for Reconsideration, and Rule 46, Electronic Filing of Documents. Rule 5. Filing Fees/Affidavit of Indigence. (2) $300 in all civil cases. Filing fees accrue upon the docketing of a direct appeal or an application for discretionary or interlocutory appeal. The fees shall be paid by the applicant or appellant or their counsel no later than the filing of the application or, in the case of direct appeals, at the time of the filing of the original brief of the appellant. (b) Exceptions to payment of fees. (3) the applicant/appellant or counsel for the applicant/appellant files an affidavit of indigency that includes an original signature and a proper jurat on the form provided by the Court (forms may be obtained from the Clerk’s office or from the Court’s website) and the affidavit is approved by the Court. The clerk shall not receive an application or original brief of the appellant unless filing fees have been paid or one of the exceptions to the rule has been met. Applications or original briefs accompanied by an affidavit of indigency are accepted by the clerk on a conditional basis until the affidavit of indigency is approved by the Court. If an affidavit is rejected by the Court, filing fees shall be paid within 5 days of the date the affidavit is denied or the application or original brief of appellant will be deemed rejected for filing. If the Court grants an interlocutory or discretionary application, additional filing fees are not required to file an appellant’s original brief in the direct appeal. All required fees may be paid by credit card with any electronic filing or by check or money order if a paper filing is made. Counsel may pre-pay filing fees by submitting a check prior to the electronic submission. The Clerk is not responsible for any cash accompanying a filing. Paper applications for interlocutory appeals, applications for discretionary appeals, briefs, and all other documents filed with the Clerk in paper form shall include only an original. All documents filed in this court and the notice of appeal filed in the trial court shall show that copies have been served upon opposing counsel by United States Postal Service, personal service, or electronic service. Service made by United States Postal Service or personal service shall be shown by signed written acknowledgment, certificate of counsel, or affidavit of server, to include the name and complete mailing address of all opposing counsel, signed by counsel and attached to the document filed. (c) Timing When Serving Via Personal or Postal Service. Service shall be made contemporaneously with or before filing accomplished by United States Postal Service or personal service. (e) Time for Electronic Service. Electronic service shall be made contemporaneously with or before filing. Filing of any document with the Court’s eFast system shall not constitute sufficient service under this rule. (f) Failure to Comply with Rule. Any document without a certificate of service or otherwise not in compliance with this rule shall not be accepted for filing. Nothing contained in these rules shall be construed to deny or limit the Court of Appeals’ inherent power to maintain control over proceedings conducted before it or to deny the Court those powers derived from statute, rules of procedure, or rules of court. When alleged attorney misconduct is brought to the attention of the Court, a lawyer admitted to practice before the Court, an officer or employee of the Court, or otherwise, the Court may dispose of the matter through the use of its inherent, statutory, or other powers, or refer the matter to an appropriate state agency for investigation or disposition. These provisions are not mutually exclusive. Breach of any rule of the Court of Appeals may result in a Court order requiring compliance. Failure to comply with a Court order may subject the offending party and/or attorney to a finding of contempt and may cause the appeal to be dismissed or the party’s brief to be stricken. Repeated violations of this Court’s rules or orders may result in the revocation of the violator’s admission to practice before the Court of Appeals. (e) No Prosecution, Frivolous Appeals, and Penalties. (1) Failure to Appear and File Brief. 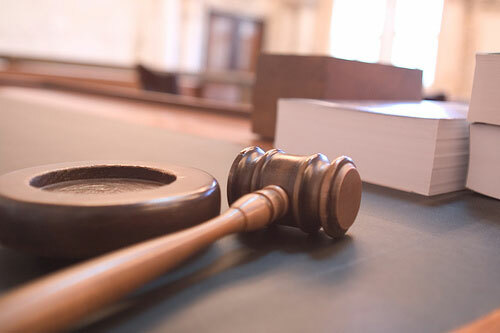 On the call of the case for argument, if the appellant does not appear and has not filed a brief, the Court may dismiss the appeal for want of prosecution. The panel of the Court ruling on a case, with or without motion, may by majority vote to impose a penalty not to exceed $2,500 against any party and/or a party’s counsel in any civil case in which there is a direct appeal, application for discretionary appeal, application for interlocutory appeal, or motion which is determined to be frivolous. The imposition of this penalty shall constitute a money judgment in favor of appellee against appellant or appellant’s counsel or in favor of appellant against appellee or appellee’s counsel, as the Court directs. Upon filing of the remittitur in the trial court, the penalty may be collected as are other money judgments. Rule 8. Notice of Cause for Disqualification or Recusal. Cause for disqualification or recusal of a judge of this Court shall be brought to the attention of the Clerk as soon as practicable. See Rule 44, Disqualifications and Recusals.